DCF.py is a software that will convert your images for viewing on your digital camera. You can get a copy of DCF.py from the "using Sony digital camera as a picture viewer" thread. Although DCF.py was originally written as part of a Sony digital camera discussion thread, it works for all brands of digital cameras that support DCF (Design rule for Camera File system). Almost all of today's digital cameras support DCF. DCF.py is a command-line utility, which means you'll have to run it from the system prompt. There are two possible reasons why you could have gotten a "Command not found" message. The operating system could not find DCF.py itself. Update your path so that the operating system could find the DCF.py script. The operating system could not find the Python compiler that is specified on the first line of the script. Simply use a text editor to modify DCF.py and change to first line to match your Python location. If "which" is unable to find python, then you'll have to install it on your system. If you get this error message, it means that you do not have the Python Image Library (PIL) installed on your computer. DCF.py uses the Python Image Library to generate the images for your digital camera. If you have a Debian package-based operating system, you can use the "sudo apt-get -y install python-imaging" command to install the Python Imaging Library through an automated process. Another option is to download the Python Imaging Library from PythonWare (see "Related Links" below) and then install it yourself. 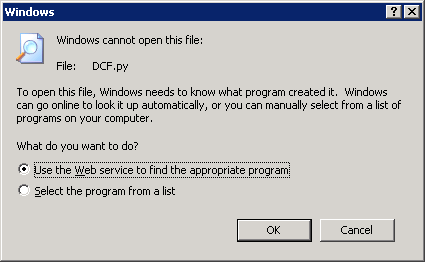 If you get a dialog box while trying to execute DCF.py in the Windows Command Prompt, then you do not have Python installed on Windows.